We were going through pictures from last month’s release of “He’s Barack Obama” and stumbled upon this screen grab. 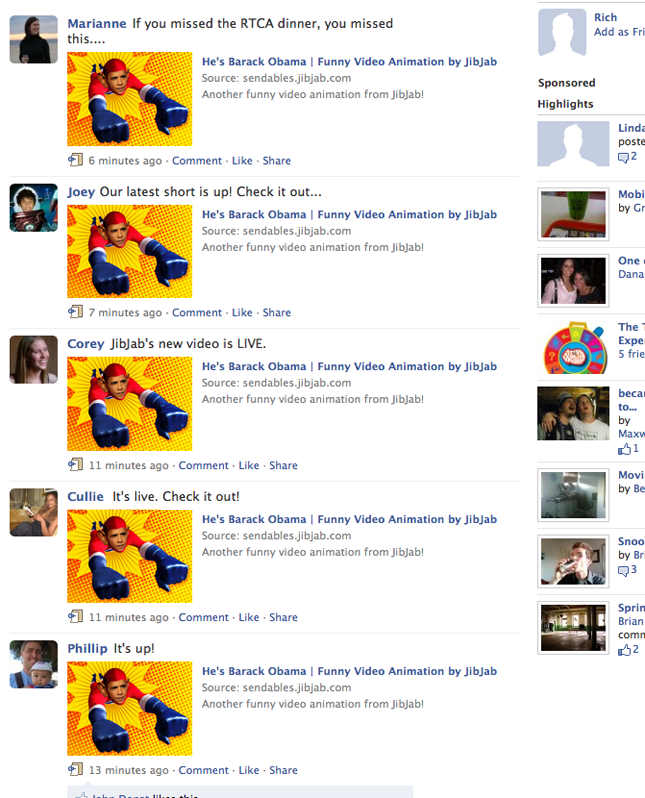 Within seconds of the video’s release, the whole team ran to Facebook and shared our latest project with our friends, completely taking over our feeds. This is what we saw when we logged in that evening… a great testament to how our whole group supports what we do (and how addicted to Facebook we are)! This entry was written by paulhanges and posted on July 29, 2009 at 7:42 pm and filed under Inside JibJab. Bookmark the permalink. Follow any comments here with the RSS feed for this post. Trackbacks are closed, but you can post a comment.